The Everest shortest trekking provides close-up views of Everest and a chance to spend time in the Sherpa villages, monasteries. 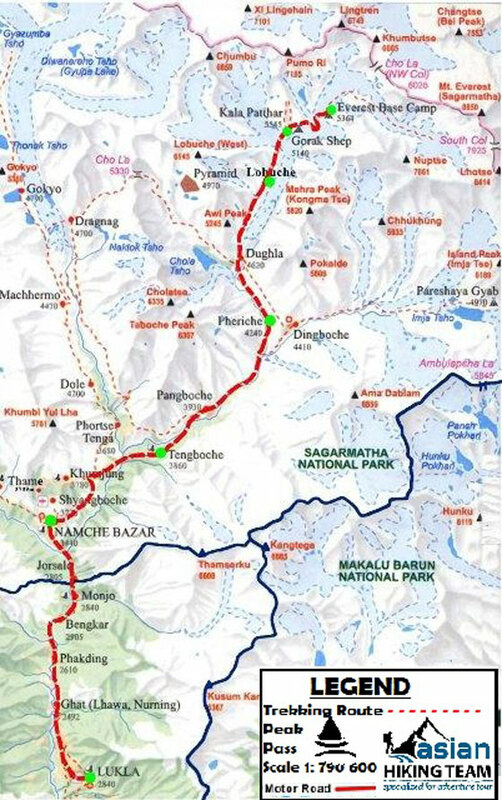 The route takes you into the Everest area, one of the busiest in Nepal. You will reach a maximum altitude of 3868 m requiring a moderate level of physical fitness to complete this trek comfortably. 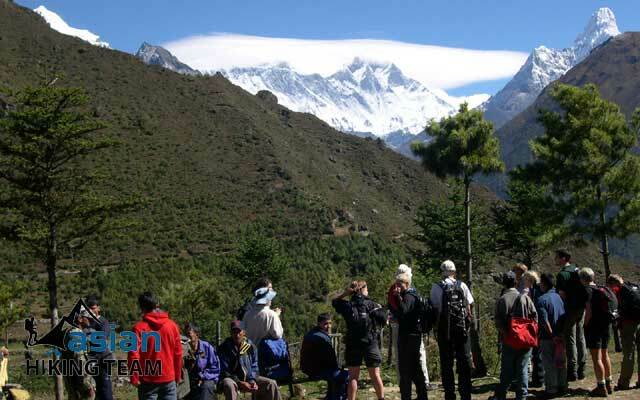 Everest view trek takes through the lush vegetation of Sagarmatha National Park, with pine forests, rhododendron flowers and an abundance of wildlife. Everest View trekking situated at 3,868 meters height in the Sagarmatha National Park and commands a spectacular view of Mt. Everest (8,848 meter). From a view point a panoramic view of Mt. Everest and many other high and awe-inspiring peaks, including Amadablam (6,856m), Lhote (8516m), Nuptse (7872m), described by many as the most beautiful peak they have ever seen. The concluding days of this trek will be spent in the delightful and scenic villages of Khunde (3700m) and Khumjung (3800m), where you will have the opportunity to interact with the legendary Sherpa people and participate in their astonishing traditional lifestyle. 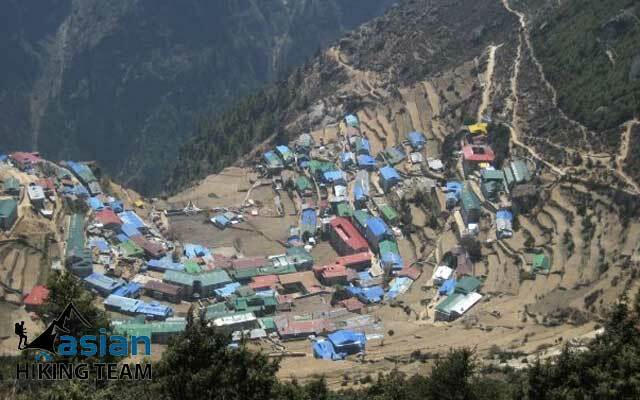 A half an hour flight to Lukla then 2 days trekking into Namche Bazaar, Namche Bazaar is the Sherpa’s head quarter. Explore the National park office, monastery, Sherpa museum, Everest view point, homeland of Sherpa village Kunde and Khumjung need one full day. Continue walk to 4, 5 hours to reach Tyangboche, the famous monastery. Many tourists join the daily worship celebration in the Tyangboche monastery at 3 PM. 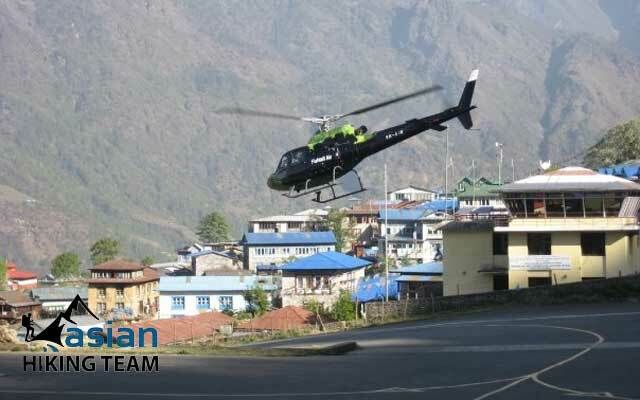 A one full day comes back down to Lukla to take a short flight return to Kathmandu. Day 01: Kathmandu to Lukla (2840m) continues trek to Phakding (2640m), 3.30 hours, Overnight Hotel. Day 02: Phakding trekking to Namche Bazaar (3440m), 5.30 hours, Overnight Hotel. Day 03: Explore Everest view point Hotel, Namche bazaar, Kunde and Khumjung 4/6 hours,Overnight Hotel. Day 04: Namche Bazzar trek to Tyengboche 3860m, 4.30 hours, Overnight Hotel. Day 05: Tyengboche trekking to Manju 4.30 hours, Overnight Hotel. Day 06: Manju trek to Lukla 4 hours, Overnight Hotel. Day 07: Flight back to Kathmandu and sight seeing or shopping/end trip, Overnight Hotel. Sagarmath National Park permits, fees. Day 01: Kathmandu to Lukla (2840m) continues trek to Phakding (2640m) 3.30 hours, Overnight Hotel. Early morning, (35 minutes) flight from Kathmandu to Lukla (2840m). 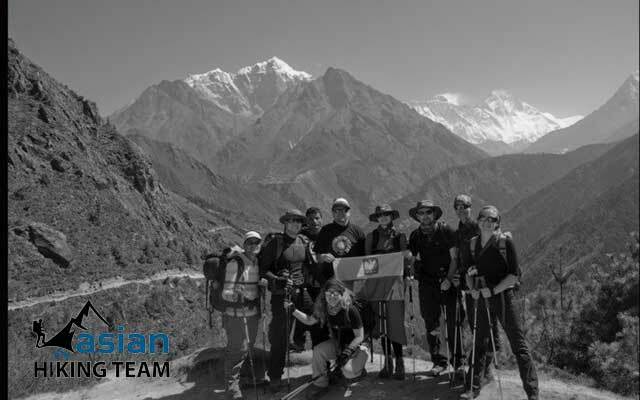 Meet our trekking crews’. After finish breakfast, to proceed from Lukla to Khumbu, head north, past a Chorten with praying wheels and join the main tail at Choplung (2696m) in less than one hour. The proceed from their head north crossing the Thado Khola (2554m) with the awesome trekking peak Kusum Khanguru (6483m) at its head. To reach Phakding (2640m), 1.30 hours from Choplung or almost 3.30 hours from Lukla, overnight in Hotel. Day 02: Phakding trek to Namche Bazaar (3440m) 5.30 hours, Overnight Hotel. To cross the west bank (right) of the Dudh koshi river, Continue through blue pine and rhododendron forests, pass a settlement if Metal worker (Tok Tok), village of Banker (2905m) with small lodge, see view of Mt. Thamserko (6856m) 1 hr. In the short while cross to the east (left) bank and climb up through Chumowa, cross the Khansar Khola to reach Mondzo (2835m). Enter Sagarmatha national park here. 1 hour from Banker. Descend in a cleft to the west (right) bank of Dudh Kosi on a suspension bridge to reach Jorsule (2774m) 30 minutes. 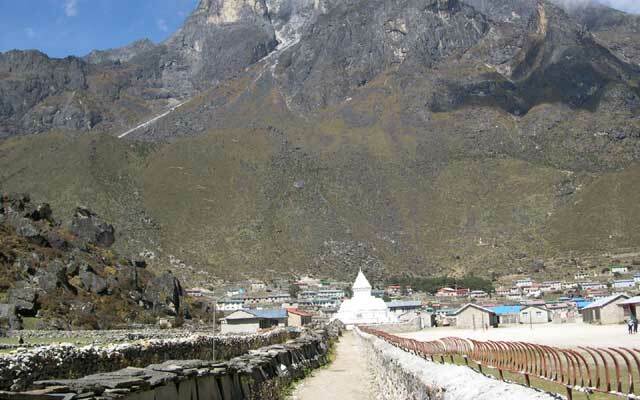 This is last village before Namche. We take Lunch here & proceed to cross Dudh Kosi (Bhote Kosi) again to the left side & again to cross the main Dudh Kosi, climb up till to Namche Bazaar (3440m), proceed in pine forest. Can see, first view of Mt. Everest between Lhotse & Nuptse reach 2 and half hours from Jorsule. Day 03: Namche Bazaar for Acclimatization rest day. Today is rest day, however, we should do some activities such as to climb Syangboche airport, visit Sherpa home in khumjung/Khunde includes Adman Hillary school or view from Everest view point Hotel 2 hours. Namche bazaar has many officials or offices, including army base camp and bank. Namche used to be trading center, where grain from the south was exchanged for salt from Tibet and it’s remains now a trading center. Every Saturday is market day. There is headquarter of Sagarmatha National park (SNP) & Sagarmatha pollution controlled Project (SPCP). Here is Sherpa Museum & monasteries too. Day 04: Trek to Tyangboche 3860 meter, 5 hours, Overnight Hotel. Today, we start our trek at 7.30 AM above the Dudh kosi River can see the Mt. Everest, Nuptse, Lhotse and Amadablam view. One and half an hour walk leisurely going up to reach Kyanjugma & Sarnaso. There is two way, we follow right steeply down to Photse Tenga. Cross the Dudh Kosi Bridge, we have lunch in there because of before Tyangboche there is not any sport for lunch. After lunch we climb up all the way to Tyangboche 3768m, 2 hours. Tyangboche is very famous for view and the Monastery. Every day 6.30 AM and 3 Pm is the Puja (praying time). We will join the Puja to success out trip, Overnight Hotel. Day 05: Trek to Manju 2840m 5.30 hours, Overnight Hotel. After breakfast we steeply down to Photse Tenga cross the bridge climb to Somare where we heading day 4. After that we return back same way to Namche Bazaar, Jursule and Manju which we have check Sagarmath National park permit 2840m 5.30 hours. Overnight Hotel. Day 06: Trek to Lukla 2840m 4 hours. Finally we return to Lukla where the trek began, which seems a lifetime ago. Enjoying time to reflect on the trek as a group and the personal achievement of all those who took part. Overnight at Guesthouse with cold & hot drinks. Day 07: Fly to Kathmandu, Overnight Hotel. Early morning flight back to Kathmandu, end your trip, free day rest and relax or shopping.